Guts, the Black Swordsman, lies battered and near death at the hands of the transformed, demonic count. Guts’s quest of vengeance might have finally found an enemy he can’t defeated. Battered, many bones broken, he struggles to stand to fight. Only the arrival of the counts young daughter, the one person the monster doesn’t want to see his inhuman form, has saved Guts. But for how much long will that last? He’ll have only one chance to defeat the count. He might be broken. He might only be human, but Guts has a will that will carry him through to his desire. He will crush all that stands before him no matter the cost to himself or others. Miura continues to peel back Guts’s backstory in this one. We finally learn who he wants to destroy and catch a glimpse of his past life with the enigmatic Griffith know turned into one of the demonic Godhand who oversee monsters like the count. Emotion swirls through this one. Miura explores how love can feed a hate so black it can destroy the person you most love and then show how that same emotion can overcome a fear so profound that it gives even a loathsome monster a chance to do something right. To make one positive choice after seven years of perversion. 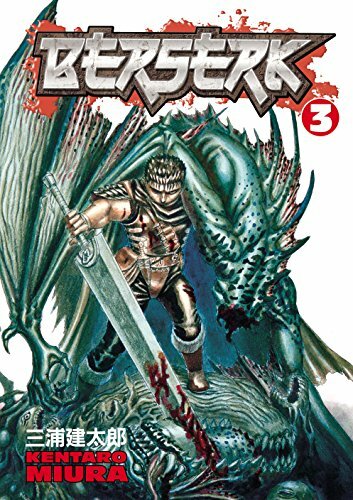 This volume is all about revealing the past of Guts, showing us the steps on the road of how he became the near-inhuman monster he is, cloaked in so much rage and hatred that his humanity can only come out in a single moment. As Vargas in the last volume was a mirror of Guts’s physical body, Theresia, the count’s daughter, is a mirror of his soul. That innocence that has been perverted by rage and anger, twisted and destroyed, leaving something else behind. I would really like for Theresia to make a reappearance in the story. The manga ends with flashing back to the beginning of Guts. Miura shows us right there in his origin why Guts is still alive. How in a world where “transcendental fate” rules all, that he survived the sacrifice, that he continues to kill the demons. Because Guts side-stepped his fate from the moment of birth. The manga leaves us eager to read more of how this abused boy grew up into the Black Swordsman. 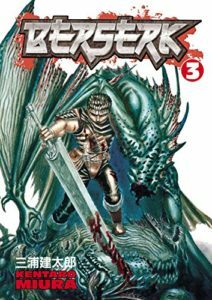 You can buy BERSERK Vol 3 from Amazon.